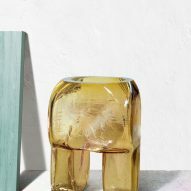 Vases with legs and containers moulded around tree trunks featured in OFF Portugal's Glass Cares exhibition of blown glassware at Milan design week. Ten different pieces were on display, all of which were designed and completed during a two-day workshop in Portugal's Marinha Grande region – known for its glass blowing. The project was initiated by OFF Portugal, an organisation set up to support young Portuguese designers and partner them with local manufacturers and craftspeople to reinterpret traditional techniques. The rediscovery and reinterpretation of craft methods has been a recurring theme at Milan design week, which includes a showcase of updated Japanese lacquerware designed by Industrial Facility. Each OFF Portugal designer spent time understanding the process behind glass blowing before working with local craftspeople to incorporate changes to the traditional method. Diana Medina modelled her rippled upside-down vase around pine cones – based on original models made using plaster moulds – and Samuel Reis also used natural forms, basing his amber-coloured vase on the shape of a tree trunk. Its finish is the result of hot liquid glass making contact with wood. Vitor Agostinho also opted for non-traditional forms, creating a multifaceted container using an experimental approach that allows different shapes to be made using a single mould. 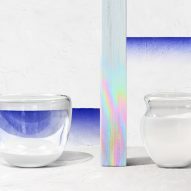 Luís Nascimento experimented with the shapes that are created when glass is blown without a mould, creating a pipe-like table lamp, while Eneida Tavares took a more whimsical approach to craft vases that sit on pairs of stubby legs. Jorge Carreira's sculptural piece resembles a soap bubble, made of glass that's been blown into a steel framework, and Manuel Amaral Netto explored how gluing glass together affects the final form. Other designers experimented with colours. 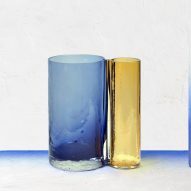 Joana Silva presented a pebble-like piece that's sliced in half to reveal its internal layers, as well as a bottle with a contrasting lid and body that explores the way new shades can be created by overlapping glass. 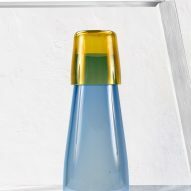 Meanwhile, Paulo Sellmayer designed a vase with a white section that makes it appear to be perpetually half full. 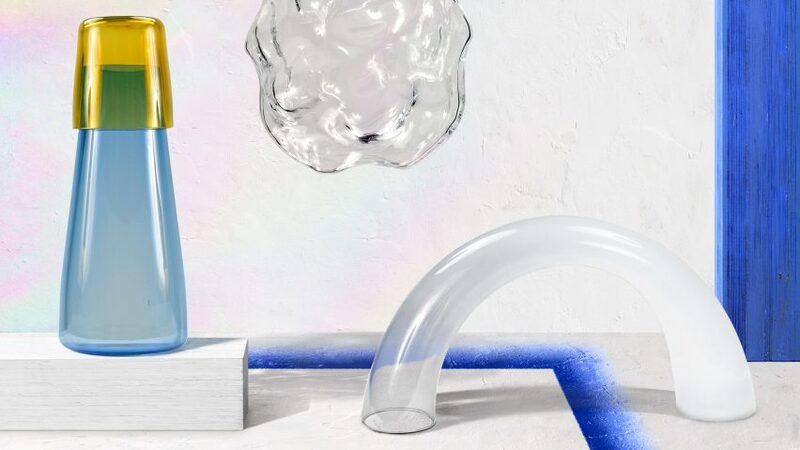 The OFF Portugal Glass Cares exhibition was held at Via Private Oslavia 1 in the Venture Lambrate district during Milan Design Week, from April 4 to 9. Other highlights from the fair included a tree-like installation by Studio Swine that blossomed misty bubbles, and an installation of mirrored and striped furniture wrapped around a 15th-century auditorium by Benedetta Tagliabue.